UC Berkeley Events Calendar: Mosse-Lecture: Can Architecture Be Democratic? Many people have an intuitive sense that the built environment is bound up with politics. 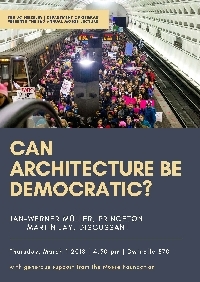 The lecture poses the question how we might think more systematically (and normatively) about the relationship between democracy and architecture as well as public spaces as a particular form of the built environment. A very basic distinction between representing democracy, on the one hand, and facilitating democratic practices, on the other, will serve as a structuring feature. Tracing the difficulties of representing democratic principles and/or the people historically, the speaker will address a number of successful examples in the US and Germany of how particular spatial arrangements can help democracy. Finally, he will pose the question whether the Internet/virtual space might replace actual physical space in fulfilling a number of functions foundational for democratic practices, continuous participation in particular  or whether filter bubbles and echo chambers will in fact contribute to democracys present-day decay. The Mosse-Lectures at Humboldt University in Berlin, founded in 1997, commemorate the history of the Mosse-family, the German-Jewish publisher Rudolf Mosse, and George L. Mosse  the eminent historian  who gave the series opening lecture on May 14, 1997. As an academic institution, the Mosse-Lectures follow the tradition of democratic liberalism in the spirit of Mosse's newspaper Berliner Tageblatt with a strong commitment to cultural exchange, transfer of knowledge, and political enlightenment. With generous support from The Mosse Foundation, the Department of German brings selected Mosse-Lectures to Berkeley.